Purely by accident we happened across the blog ALWAYS SEARCHING FOR MUSIC. It is run by ‘Garychching’ and appears to be him ripping old stuff (mainly punk) off vinyl, uploading it as MP3s into cyber space and posting links. 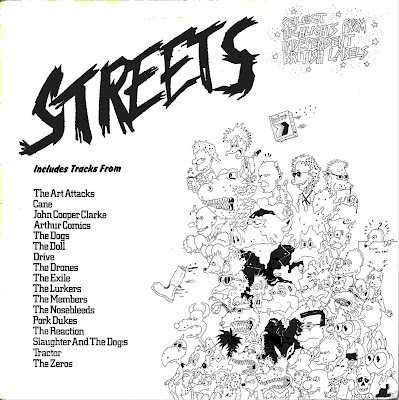 As I type we are bopping around to the classic punk compilation from 1977 ‘STREETS’. A quick look down the previous posts reveals a wealth of forgotten ‘old skool’ punk classics, dating back to days of old, when punks were bold and mohicans had not been invented, like LONDON, THE ART ATTACKS and… just go and look for yourself. I am sure we will be clicking on the old ‘save target as’ button quite a bit in weeks to come. This is what blogs are for! Nice one Gary. TOFU LOVE FROGS INTERVIEW: Yes, the Tofu’s are back. Those of you that have been with us for a while will have fond memories of gigs they did for us ‘back in the day’. They were fast, they were furious, they were entertaining and they were messed up on drugs. Has old age got the better of them? Are they shadows of their former selves, just old codgers going through a mid life crisis? The simple answer is no, the only difference is that they now have to take more drugs to get where they used to be… and they do. Read about why they split, what they have been up to, why they got back together and what they plan to do in the future. Expect tales of drugs, losing fingers in boat accidents, weddings at Nenah Cherry’s house, anarchy and e-bay. GIG GUIDE: A gig guide was always an integral part of the concept of the Iguana Website, which makes it rather odd that we have been online for nine months and have only just got around to it. It is in its early stages and as we type only has dates for February, but keep an eye on it, we be getting there slowly (Cue Al iguana shaking his head in disbelief of the amateurishness of it all). If you hear of anything we should add, let us know. That be it for now, we wont detain you any longer, you are no doubt all in a rush to head on over to http://www.peppermintiguana.co.uk. You will find links to all the new stuff on the front page. While you are at it.. why not join the mailing list? Go to the bottom of the home page and bung your e-mail in. Well…. yet another attempt to breath life into this ‘ere blog. Today me and the Spark drove up to the Midlands to watch West Bromwich Albion V Cardiff City, our first away game of 2008. We knew that the West Midlands Old Bill were a pain in the arse and would mess the busses about and were quite pleased with how smooth everything went in terms of getting to the game. The busses were taken in convoy from the services (four miles from the ground) on a guided tour that started off an hour before kick off and ended up with the buses arriving at the ground 20 minutes after kick off (what planet are these pratts in blue on, were they trying to start trouble?). We were oblivious to this though, arriving undetected by the old bill and wandering around at will. Really glad we drove rather than went by bus. The Game was a cracker; with City going ahead 30 seconds after kick off and staying ahead till almost the final whistle. It was end-to-end stuff and the equaliser ironically coming from a City own goal. Final score WBA 3 Cardiff City 3. Nothing to be ashamed of, travelling away to the top of the table and giveng them a run for their money. The journey home started well, apparently there was a similar run around for the busses on the way home as well. We just walked back to the car park and drove off. Our luck was not to last though, broke down on the M50 with major car trouble. The RAC (when the finally arrived) were flummoxed, so we came home on the back of a truck. Still better than being messed about by the forces of law and order though.